If you are interested in Birding Westfjords Iceland Tour, come and join us at Kaiyote Tours! We start out this 10-day trip in Reykjavik. This is a great area for birding and walking the shore line. Reykjavik is a great city for art and culture. We will fly to the Westfjords and spend four days visiting some of the most amazing landscapes, waterfalls and birding colonies in Iceland. We will spend our last day back in Reykjavik. The flight from Reykjavík to Ísafjördur takes 45-minutes. Once we arrive in Ísafjördur, we will be staying at the Ísafjördur Hotel. Dinner will be in town. There will be time for birding, hiking and exploring Ísafjördur. From Ísafjördur it is a beautiful drive and amazing road to the quaint little seaside town of Patreksfjörður with many sights to see, including some amazing waterfalls like the Dynjandi. For the next three nights we will be staying at lodging in town. The Westfjords is all about birds and amazing landscapes. We travel to the Látrabjarg cliffs to view puffins, razorbills, guillemots, cormorants, fulmars, gulls and kittiwakes nesting colonies. We will also see arctic foxes and many other species of birds. This will be a full day of watching the birds and the arctic foxes of Látrabjarg cliffs and the Westfjords. This area has great hiking, too. We will be visiting the Látrabjarg cliffs very early in the morning to find foxes and birds. During the midday we will be visiting a village called Tálknafjörður for lunch and a swim in the geo-thermal pool. In the afternoon we will be visiting one of the most spectacular beaches in all of Iceland called Rauðasandur. Dinner will be at Breiðavík on our way back to the Látrabjarg cliffs for an evening with the puffins. We will be returning to Patreksfjörður late enough to see the sunset at 11:30pm. From Patreksfjörður it is a 1-hour drive to the villages of Brjánslækur and Flökalundur. From here we will be taking a 2.5-hour ferry boat across the Breiðafjörður to the Snæfellsnes Peninsula where we will be spending the night in a town called Stykkishólmur. In this area we have seen White-tailed Eagles and Gyrfalcons. 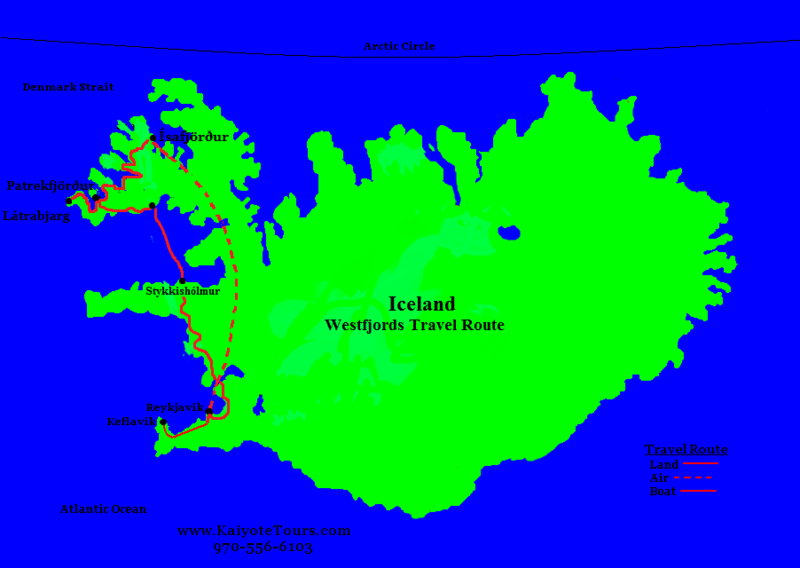 We will take the day to get back to Reykjavík because we will stop at lava fields and birding areas along the way.